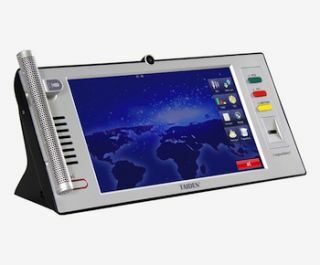 An advanced all-in-one conferencing solution for high-profile boardrooms, the TAIDEN Multimedia Congress Terminal with a 10-inch touch screen is now available with microphone array. Users can watch live video, access the file server, share PowerPoint presentations, vote on corporate resolutions, hear far end audio or even capture the video of the speaker from the on-board camera for video conferencing. All content is available to meeting participants from their conferencing terminal, replacing the need for laptops in the boardroom. To be showcased for the first time at InfoComm12, booth #C10336, the model with microphone array offers superior audio performance and is available for sale in North America via Media Vision USA.